Home / France / Reportback from YellowVests actions on December 22 in #Nantes: An Upgrade for Christmas? Reportback from YellowVests actions on December 22 in #Nantes: An Upgrade for Christmas? Macron’s world is trying to spread the word that the Yellow Vests movement runs out of steam, but in Nantes the movement is still growing. A report from the events on December 22 in Nantes. Originally published by Nantes Révoltée Facebook page. Edited machine translation by Enough is Enough. Several thousand people took the streets of Nantes two days before Christmas. There were demonstrations throughout the city. The prefecture and city hall were targeted. A demonstration that lasted several hours, until the night, with police attacks. In Nantes, the movement does not “run out of steam”. It is ascendant. 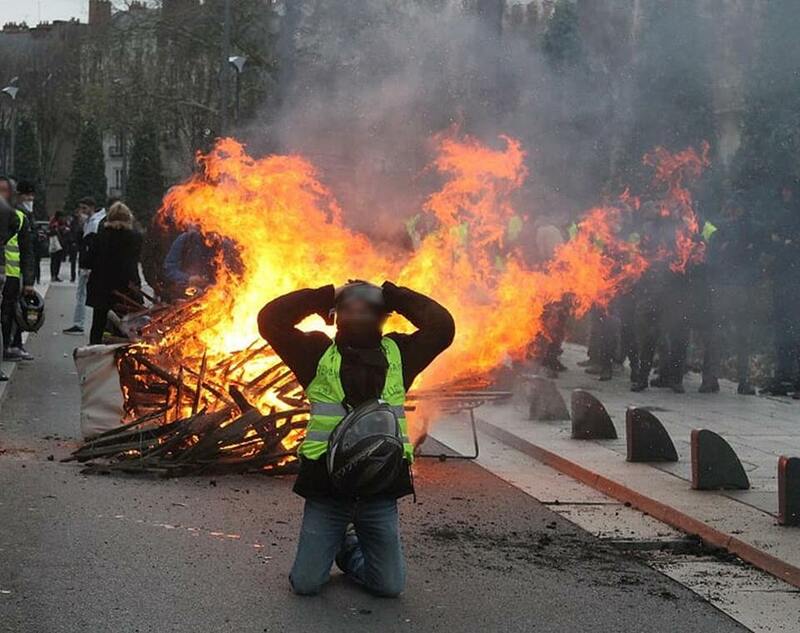 Two days before Christmas, the government had written the scenario of this new day of action of the Yellow Vests in advance: The movement is weakening, it is time to go home. It must be said that for more than a month each gathering is relentlessly asphyxiated from attacks with grenades and that there was a risk of a weaker mobilzation on the eve of the holidays. This December 22 was a surprise, since it undeniably marked the peak of the Yellow Vests movement in Nantes. To avoid being smashed and bombarded with tear gas like all demonstrations before, an unprecedented and surprising last minute call was released on Fridayt. Five separate meeting points in the city. This confusing form of mobilization has clearly confused police authorities, intelligence services, the media, and even the regular participants of the demonstrations! We heared: “It seems that the BAC Nantes has a terrible reputation. Here, look, they are there. ” A few moments later, a group of yellow vests goes into contact with these hooded policemen, and, almost head to head, make them back off under boos but without violence. Unbelievable. It was finally possible to march through the streets of Nantes. We were marching on route. The demo was marching through all the streets that are usually forbidden, including the shopping streets, in a jovial atmosphere. The demo was growing more and more, up to 5,000 people at its peak. Access to the Cathedral Square is cordoned off by a line of CRS cops? Some Yellow Vests go around an adjacent street while others stay in front of the police. The police line is encircled on both sides, shouting “We want bonuses too!”. And here the cops had to gave up their line again without violence. A first moment of tension took place in front of the prefecture. Colorful smoke against tear gas. But the demonstration left to return one hour later but a lot more determined. Ladders were brought and put against the walls of the prefecture to invade the garden. In 1968, the building of Nantes had been occupied by the demonstrators. It is this old dream that reappears for a moment. The initiative is seriously discouraged by the CRS, but one, then two particularly daring protesters – and obviously insensitive to gas – rose to the gardens. One of them, balancing on the wall, facing the police, holding strong while he was gassed. This moment of grace gave wings to the demonstrators. This was the beginning of a siege of the prefecture that lasted several hours. A fire burned in front of the entrance. Barricades were lit along the Cours de 50 Otages. The parasol of a bakery served as protection against police shootings. A line of CRS had to retreat in dispersed order against a crowd of Yellow Vests running in their direction screaming, but without throwing objects. The police, overwhelmed, used a lot of ammunition against the crowd, and many protesters had to be evacuated to the back, wounded. At least one person was hit on the head, next to the eye, bleeding heavily. While the bulk of the confrontation was concentrated in front of the prefecture, another demo took advantage of the confusion to go to city hall. Yellow vests armed with a stone spear broke many windows, and have thrown garbage in the building. Night wass falling. Several meters high flames lighted the course. The demo returned to the city center, and rushed into the streets of the Bouffay district. There were still several thousand people with a lot of energy, insatiable. The shops closed their windows on their way. Clashes took place at rue de Strasbourg. Fireworks. Clusters of yellow vests were scattered throughout the city. Nantes Révoltée, December 23, 2018. To celebrate the opening of the Enough is Enough Info-Café we offer discounts on many items in our shop to support our new project. T-shirts from 10€ – 15€, and we have some discounts on Tickers, posters, hoodies etc.Click here or click at the image below.